late at night and the list goes on! wow ! love this, totally my kind of outfit... perfect tee, perfect shorts, perfect shoes ! Agreed. I love not having to wear (take on and off) so many layers as well. I'm in a happy place when I'm in the sun. I love the outdoors and our annual summer vacation to the mountains! Obsessed with this look! 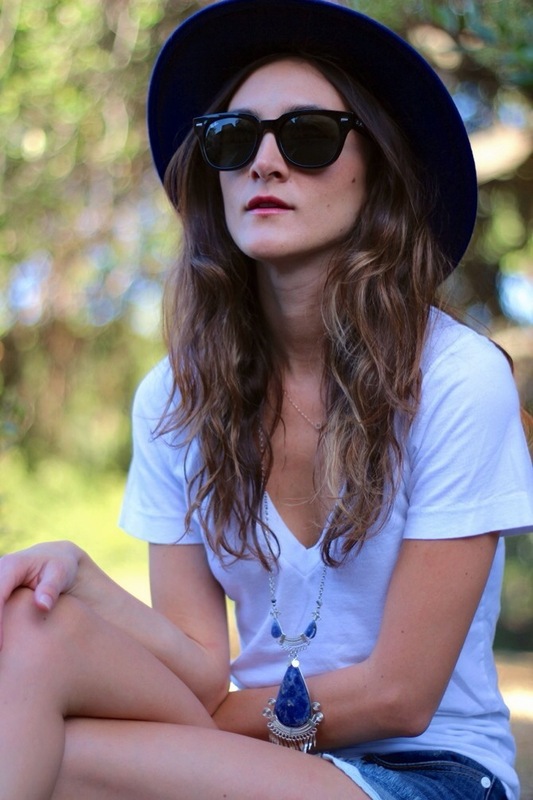 There's something about a white tee and denim cutoffs! That list pretty sums up what we love about summer. Festivals are our favorite part of summer :) Also, you look darling as always. That neck piece is really interesting! In a good way, of course. Great causal outfit...sometimes you just need a simple outfit to spice up with the accessories :) Love the striped espadrille loafers, and I've been looking for a wide brimmed fedora like yours!! Pure summer! Love it girl.